Oral and dental care are important components of general health and wellbeing. Taking proper care of teeth requires a consistent daily routine plus annual visits to the dentist for procedures that need to be performed by professionals. Not only are flossing, brushing, and check-ups necessary to help prevent cavities, but they can help stop gum disease, check for signs and symptoms of oral cancers, and monitor the connection between oral health and heart disease. What does a proper dental care routine look like? Daily flossing is necessary for optimal dental health and to prevent gum disease – though it’s often part of the care routine that is skipped. It aids in removing plaque that regular brushing can’t reach in-between teeth and at the gum line. A proper flossing technique is necessary to reap the benefits, however. 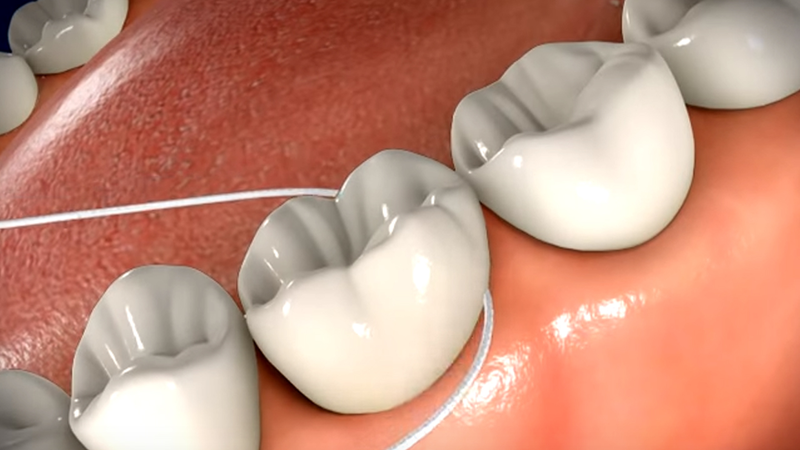 For directions and illustrations of the proper flossing technique, visit here. Many people believe that simply sawing the floss in-between the teeth is adequate; however, the surface of teeth need to be gently scaled by the floss in a C-shape. Teeth need to be brushed twice a day, ideally when you awake in the morning, and before you go to sleep at night. Dentists recommend brushing for a minimum of two minutes. This length of time is longer than you might imagine. Set a timer to get used to the duration required. A soft brush with a small head is best to avoid harming gums and potentially contributing to recession. However, your dentist may recommend a medium tooth brush if you have healthy enamel and difficult plaque build-up. To properly brush, hold the bristles at a 45-degree angle at the gumline and brush downward or upward (depending on upper or lower teeth). Brush the outer and inner sides of the teeth in this way. For the chewing surface, a gentle back and forth brushing motion will get into the crevices. The tongue is also a place for bacteria build-up, so it may be gently brushed as well. A manual toothbrush gives you full control over the brushing motions, and an electric toothbrush has vibrating action to effectively remove plaque. The latter makes toothbrushing less cumbersome and comes with multiple settings to aid with proper timing and techniques. It’s best to ask your dentist which brush they recommend for you, in case your gums are too sensitive for an electric option. Replace your brush or brush head every three months. As for toothpaste, look for brands that are recommended by the Canadian Dental Association or the American Dental Association. Pastes will sometimes focus on a dental concern like sensitivity or stained teeth. At minimum, make sure the brand helps to safeguard against cavities, gingivitis, and provides tartar protection. Flossing and brushing can be followed by the use of a mouthwash, but it is not necessary. Mouthwash with a high alcohol content can cause dry mouth. Mouthwash is not adequate to replace brushing and flossing, and it will not prevent cavities, gum disease, tartar, etc., on its own. Every 6 to 9 months, you should visit your local dentist for professional care. Your dentist and hygienist will provide an examination and a cleaning. They will check for cavities and signs of decay, signs of gum disease, plaque and tartar build-up, and signs of other oral problems like cancer. They will use implements to clean plaque and tartar on the teeth, which cannot be removed by flossing and brushing, plus other cleaning applications like fluoride and polishing. X-rays might be necessary to check for cavities and the internal status of the teeth and gums. Dentists can also provide orthodontics, cosmetic procedures, and other oral health assistance, so be sure to regularly schedule check-ups and consult about oral health care.